We love it and you will too, so give it a try and see. As ever, there is no one way about anything. Variations, variety and change are always a good thing. So make it this way, or serve it in cups, otherwise, you can try the Tiramisu Crepe Cake which I absolutely love too! I have included a video of the recipe, take a look, super easy and very impressive. Everyone loves a crepe cake! Make the Mocha cake from the link above, make sure to make it in full portion, not minis and only make the sponge without the creams. Once done, cool completely on a wire rack. Once cooled, slice the cake into 3 equal layers. Set aside until ready to use. In a medium bowl, mix together the mascarpone cheese, powdered sugar and vanilla seeds. Stir in half the quantity of the shaved dark chocolate. Set aside. Heat the coffee syrup and add the rum to it. Place the first layer of cake on your cake stand or board. Spread 1/3 of the coffee syrup over it, then top with 1/2 of the mascarpone cheese mixture and spread. Add the second cake layer and spread with 1/3 of the syrup, followed by the remaining mascarpone cheese and finish with the 3rd layer spreading the remaining syrup over it. Using chilled beaters and bowl, whip on medium speed, the whipping cream and coffee liqueur or syrup until soft peaks form. Spread the whipping cream thinly over the sides of the cake and heavily over the top. Line the Millefoglie or ladyfingers all around the sides of the cake. Sprinkle the tops with cocoa powder and the remaining chocolate shavings. 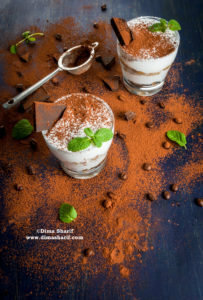 You can also serve tiramisu in cups. To assemble in cups you don’t have to make the Mocha cake, go for only the biscuits instead.Cube the Italian Millefoglie. Soak each cube in the coffee syrup and place at the bottom of each cup. Top with a layer of the mascarpone mixture. Add another layer of soaked Millefoglie cubes and top with some crushed Millefoglie. If your cup is big enough for another layer of Mascarpone mixture, then add another layer of both the mascarpone and soaked cookie cubes. If not, then just move right to the whipped cream layer. Spread the whipped cream over the top of the last layer and sprinkle with grated chocolate or a layer of cocoa powder or both.